The regular education news is the usual maelstrom of misery, with the front page news tomorrow being that school places should be allocated by lottery. Ever wondered what happens in the room to the left of the main bar in the clubhouse? Well, every week, schools from around the area are treated to the unique experience of the Playing for Success (PfS) Scheme at Bath Rugby’s Education Centre or the Bath REC for short. Run by Pete Brealey and Chris Andrew, the PfS initiative seeks to develop children’s literacy, numeracy, self-esteem and confidence through rugby. With constant interaction with first team and high profile players, children are able to utilise the facilities around the Rec to learn. Last week, the Bath REC had its official launch and invited guests were entertained with a number of events including a traditional Haka performed by pupils of Fitzmaurice Primary School, a talk from Children’s Minister, Kevin Brennan MP and a reading from school pupil, Kyle Grogan. Politicians are now contributing very little that is positive to education, but they do wield enormous destructive power, so it is probably a good thing to keep these people, as it were, on side, by inviting one of the tribe to be present and to wallow and photo-opportunise in the good vibes of this promising sounding scheme. 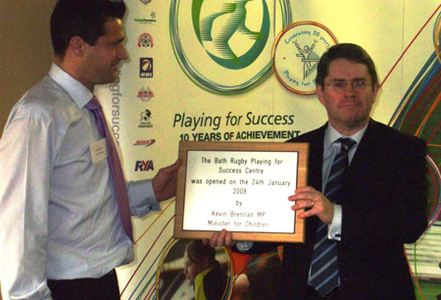 “Government Minister launches the Bath Rugby Education Centre” is what the Bath rugby website itself says. Launches as in smashed a bottle against it, or some such gesture. I doubt if Kevin Brennan MP did very much else to help. Sport is a crucial part of the story of how boys are turned into men. As many schools have retreated from sport, and consequently lost some of their ability to educate boys, it is only logical that the sports clubs should move down the age scale and into education. There will be more stories like this.